Graham Wallace will be finding little time for respite. A draft version of his 120-day business review is thought to be ready for senior figures within Ibrox, the rate of season ticket renewal uptake will be evident to the ticket office staff and supporters have raised questions about executive bonuses. 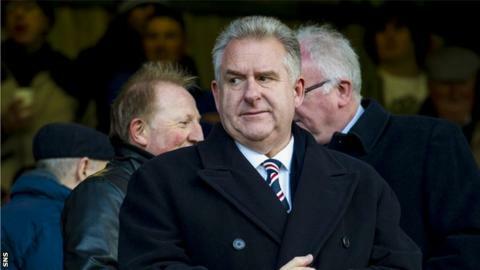 He understood that he would not face conventional challenges when he took on the chief executive role at Rangers in November, but he will never have felt under greater scrutiny than now. Wallace brought with him an impressive CV and a strong reputation. Within English football circles, particularly at the highest level, Wallace remains an admired figure. Former colleagues at Manchester City, where he was chief finance officer then chief operating officer, still talk enthusiastically about his personal and professional qualities. Often, staff in other departments would turn to Wallace for advice on how to deal with difficult situations, even though they were not specifically his remit. Those qualities, and the experience gained during three years at IMG and five at MTV Networks, do not suddenly dissipate. Wallace understood the situation he was walking into when he accepted the job offer and believed that he could - as an independent figure - find a solution to the state of conflict around the club. The result of December's annual meeting of Rangers International Football Club shareholders was an endorsement of his credentials and he might not have anticipated such a protracted state of upheaval. It is questions that he has been assailed with. Former director Dave King, pointedly, asked if the board was seeking financing last December while Wallace was publicly declaring that there was enough cash to sustain the business to April. The Union of Fans asked about his bonus arrangements and specifically if he is entitled to 100% of his salary, the same contractual arrangement as one of his predecessors, Charles Green, and the former finance director, Brian Stockbridge. It was Wallace who removed Stockbridge from his post in January before bringing in the former Liverpool financial director Philip Nash in an advisory role. Both men have solid reputations, but neither is likely to have encountered such a difficult situation as the business of rebuilding Rangers. Wallace inherited a mess, with the money raised by the launch of RIFC on the alternative investment market having been spent and the revenue being smaller than the club's outgoings. Rangers were also tied into most of the commercial contracts agreed by Green, although Wallace has struck a sponsorship deal with the online casino, 32Red, which is for three years. There is, though, a fundamental challenge. Rangers need recapitalisation - something Wallace has always acknowledged - as well as the rebalancing of costs that the chief executive has been pursuing. At the AGM, he announced a 120-day review of every aspect of the business. This was a required initiative - the interim results to 31 December 2013 showed a £3.5m loss - but the timescale was ill-judged. Football clubs are simple businesses, with mostly fixed costs and income, but very difficult to run because of the impact of sporting performance on the finances. It seemed to supporters as though Wallace was buying time. There was also a credibility issue when it was announced in February that £1.5m was being borrowed from two shareholders, Sandy Easdale and George Letham, with the money secured against Edmiston House and the Albion Car Park, given Wallace's previous assertion about the cash in the bank. The 120-day deadline passed on Thursday 17 April and an update on the review will be released on Friday 25 April. It will need to declare how Rangers will raise the funds to match the investment requirements. The football department needs an overhaul, with a scouting network required, but also more strategic decision-making when it comes to the first-team budget. Costs are imbalanced and manager Ally McCoist agreed to accept a pay cut, but a long-term, sustainable approach needs to be implemented to return Rangers to the top flight in a competitive state. Ibrox Stadium and Murray Park also need maintenance work, but bringing the business back to an even keel by cutting costs and increasing revenue streams will not provide the level of additional funding that Rangers need in the short to medium-term. With the board having ruled out borrowing against their major property assets, the options are limited. A fresh share issue, which King is keen to underwrite, would dilute the holdings of any current shareholders who do not reinvest. This would alter the shareholder dynamic and the power base that supported the current directors at the AGM. It is this problem that Wallace has to solve. If he presents a review to the board that steers the business towards recapitalisation, will all of the directors agree? There is also the more pressing issue of season ticket sales. The renewal process is underway and the deadline is the week following the business review update. Many supporters have grown weary and cynical of the machinations, on all sides, of the saga. Yet renewals are critical, since the interim accounts published in March revealed that going-concern status for the next 12 months was only granted on the basis of an increase in season ticket prices and sales. If the renewal numbers are in decline, there is a legitimate question about how Rangers will be funded until the end of next season. Wallace is experienced and capable but also at the mercy of the situation he took on - although earning the trust of the entire Rangers fan base was always unlikely given the tensions that exist between different groups. There are some decisions he might, on reflection, have made differently, but it is the ones he makes now that will be critical, to his future and the club's.